This publication is part of the Low-cost Internet training module. Access from AT&T is AT&T’s high-speed internet adoption program for low-income households. It provides low-cost internet service for $5 or $10 a month, depending on speed. Cost: Speeds of between 768 Kbps and 10 Mbps are available; qualifying households receive the fastest available tier. Service providing 5 Mbps or more will cost $10 a month, and service providing 3 Mbps or less will cost $5 a month. Service will include a monthly data allowance of either 150GB or 1TB, depending on the type and speed of service you receive, as well as access to the national AT&T Wi-Fi hotspot network. If you exceed your monthly data plan allowance, you will be automatically charged $10 for each additional 50GB of data you use, even if less than the full 50 gigabytes is used. Participants do not have to pay for installation, activation or the modem or gateway, and no deposit is required. Equipment: Access from AT&T service includes a Wi-Fi–capable modem or gateway that broadcasts a Wi-Fi (wireless) signal inside your home, allowing you to extend the reach of your wireline internet service. You can access this Wi-Fi signal on a variety of devices that are Wi-Fi compatible, including laptops, tablets and smartphones. AT&T will send you a self-installation kit with step-by-step instructions so that you can complete the installation process yourself. However, if you need help after attempting self-installation, you may request a technician (at no charge) to assist with installation. With an address in AT&T’s 21-state service area, where it offers wireline home internet service and at least one of the five speed tiers offered under the program. Without outstanding debt for AT&T fixed internet service within the last six months or outstanding debt incurred under the Access from AT&T program. How to apply: Visit the Access from AT&T website or call 855-220-5211 (English speakers) or 855-220-5225 (Spanish speakers). In addition to providing identification and address information, you will need to submit proof of SNAP participation (a copy of either a SNAP card or a SNAP participation or benefits letter) or, in California only, receipt of SSI (a copy of either an original award letter from the Social Security Administration or a current Benefit Planning Query statement [BPQY] Form SSA-2459). Internet Essentials is Comcast’s high-speed internet adoption program for low-income households. It provides low-cost internet service for $9.95 a month with in-home Wi-Fi included, as well as 40 hours per month of access to the Xfinity Wi-Fi hotspot network outside the home. It also includes the option to purchase an internet-ready computer for $149.99 plus tax, and offers access to free digital skills training available online and in person. Cost: For $9.95 a month plus tax, Internet Essentials subscribers get up to 15 Mbps downstream, which is enough to power multiple devices simultaneously. All customers receive an in-home Wi-Fi router and 40 hours per month of access to the Xfinity Wi-Fi hotspot network outside the home, allowing them to connect any internet-enabled device, such as tablets or smartphones, which could help save money on monthly wireless bills. There is no credit check, no term contract, no equipment or activation fee, and all customers are eligible for a free professional installation. Equipment: Your welcome kit includes a modem (with built-in Wi-Fi) and setup instructions. Internet Essentials customers have the option to purchase an internet-ready computer for $149.99 plus tax. The computer is delivered pre-loaded with Microsoft Office and Norton Security Suites. Live in an area where Comcast internet service is available (and in a pilot market for pilot programs). Have not subscribed to Comcast internet within the last 90 days. K-12 Program: Open to any family that has at least one child eligible for the National School Lunch Program. Families whose children attend schools with 40 percent or more participation in the National School Lunch Program can get instant approval without needing to submit additional paperwork. Housing Assistance Program: Open to households who receive HUD housing assistance, such as Public Housing, Housing Choice Vouchers (Section 8 Vouchers) or Multifamily Assistance (such as Project-Based Section 8 and 202/811). Low-income Veterans Program: Open to low-income veterans (DD-214 or DD-215) receiving state and/or federal assistance. Senior Citizen Pilot: Open to low-income seniors (62 years or older) receiving federal or state public assistance and residing in Atlanta, Boston, Detroit, Hartford, Houston, Miami-Dade County, Palm Beach County, Philadelphia, San Francisco, San Jose, Santa Clara County or Seattle. Community College Pilot: Open to community college students receiving a federal Pell Grant and residing in Illinois or Colorado. Regardless of participation in the Internet Essentials program, households are eligible to attend free Comcast digital skills programs in person (operated by Comcast training partners), or take advantage of free online tutorials. How to apply: For more information or to see if you are eligible for Comcast Internet Essentials, visit the website or call 855-846-8376 (English and Spanish). Call center agents have access to translators to help callers speaking a variety of languages, and program materials are available in 12 languages beyond English and Spanish, such as Somali, Chinese, Korean and Russian. Spectrum Internet Assist is Charter Communications’ low-cost high-speed internet program for qualifying households. It provides up to 30 Mbps with no data caps, modem included, for $14.99 per month plus taxes and fees, wherever the service is available. Cost: For $14.99 per month plus taxes and fees, Spectrum Internet Assist subscribers get up to 30 Mbps downstream, which is enough to power multiple devices simultaneously, and 4 Mbps upstream. An internet modem is included in that cost. For an additional $5 per month, subscribers can receive a Wi-Fi router so that multiple users throughout the home can use the service (avoidable if you purchase and set up your own Wi-Fi router). No contract is required. Equipment: An internet modem will be provided when you sign up for service. A Wi-Fi router costs an additional $5 per month, but this monthly charge can be avoided if you purchase and set up your own router. Have at least one child who receives free or reduced cost lunch through the National School Lunch Program or is a recipient of the Community Eligibility Provision (CEP) of the NSLP, and/or a senior (65 and over) who receives SSI. Not have subscribed to a Charter broadband plan in the 30 days prior to enrollment. Not have any unreturned equipment or outstanding bills for Charter services that was incurred in the year prior to requesting Spectrum Internet Assist service. How to apply: Visit the Spectrum Internet Assist website, where you can enter your ZIP code to find out if service is available in your area (Spanish speakers can click on a link to be taken to a translated site). Then call 844-525-1574 for more information or to subscribe. EveryoneOn is a national non-profit that creates social and economic opportunity by connecting everyone to the internet. EveryoneOn collaborates with diverse internet service providers and device providers to feature their low-cost solutions on its digital platform: EveryoneOn.org. Featured low-cost internet programs include Access from AT&T, Cox Connect2Compete, Google Fiber, Internet Essentials from Comcast, Mediacom Connect2Compete, Spectrum Internet Assist from Charter, and a few other smaller providers. Cost: Eligible households receive internet access for as low as $9.95 per month (plus taxes), Wi-Fi modem included. There is no deposit required, no contract to sign and no installation fees. Equipment: A modem will be provided at no charge by the cable company providing your service. Have at least one student in grades K-12. Have at least one person in the household participating in the National School Lunch Program (NSLP), SNAP, TANF or public housing. Not have subscribed to Cox internet service in the last 90 days, and must not have outstanding Cox bills or unreturned equipment. Have at least one child participating in the National School Lunch Program. Not have subscribed to Mediacom internet service in the last 90 days, and must not have outstanding Mediacom bills or unreturned equipment. Low-cost internet programs offered by other internet service providers partnering with EveryoneOn may charge different prices, deliver higher or lower internet speeds, include or not include needed equipment, and have different eligibility requirements. How to apply: Visit the EveryoneOn.org website, where you can enter your ZIP code to find local plans and enroll online (Spanish speakers can click on a link to be taken to a translated site). To learn more about the Cox Connect2Compete program, visit the Cox website. To learn more about the Mediacom Connect2Compete program, visit the Mediacom website. PCs for People is a non-profit that started out with the goal of bridging the digital divide by providing the necessary tools to put a functional computer into the hands of low-income individuals and get them online. In 2012, PCs for People began offering low-cost, unlimited internet through a partner service provider. In early 2016, the organization expanded its coverage network to help its customers nationwide access unlimited data at 4G LTE speeds. Cost: Eligible households receive internet access for as low as $10 per month with prepayment of one year ($120) and online enrollment/purchase. Three-month and six-month plans are available as well, for $13.33/month ($40, prepaid) and $12.50/month ($75, prepaid) respectively. Because all plans are prepaid, there is no credit check. New customers, regardless of plan length, are required to purchase a wireless LTE modem through the program, which costs $80. Equipment: The modem required with initial sign-up costs $80. Eligibility: To receive services from PCs for People, a potential recipient must be below 200 percent of the federal poverty level or be currently enrolled in a qualifying income-based government assistance program. How to apply: Visit the PCs for People website to view packages. When you click through to purchase, you are taken to a page where you can verify that there is coverage in your area (anywhere the Sprint network is available) and begin the online enrollment/purchase process. You can also order via phone (651-354-2552), but PCs for People must first receive your proof of eligibility via an upload through your online customer account, an email to [email protected], or a hard copy mailed along with your name and phone number to PCs for People at 1481 Marshall Avenue, St. Paul, MN 55104. Lifeline is the Federal Communications Commission’s (FCC) program to help make communications services more affordable for low-income households. The program has for years provided a discount on basic residential (home) phone service, eventually adding wireless phone service as an option. In December 2016, the program expanded to provide the same discount on broadband internet. However, as of of mid-2018, the availability of Lifeline broadband service was still very limited. Qualifying households should check with their local service providers regarding the availability of Lifeline broadband or other low-cost internet service programs. You can also find out if any carriers offer Lifeline broadband service in your area by entering your ZIP code on this webpage. Eligibility: You qualify for federal Lifeline if your income is 135 percent or less of the federal poverty guidelines for your household size and state, or if you or someone in your household receives SNAP (food stamps), Medicaid or benefits under one of the other qualifying federal assistance programs. You must show proof of income or program participation when you apply. You are only allowed one Lifeline discount (phone or internet, but not both) per household, not per person. How to apply: You apply for Lifeline through the company that provides the service; it will verify your eligibility and process your application. If you already have internet service that you pay full price for, ask if the company offers Lifeline broadband. If not, find out if the company offers its own low-cost broadband program for low-income households. You can also check the Lifeline map for a list of providers in your area. If Lifeline internet isn’t available, but you qualify for the Lifeline program, take advantage of the Lifeline discount for your home or wireless phone service and get your broadband through one of the non-Lifeline low-cost internet programs being offered. 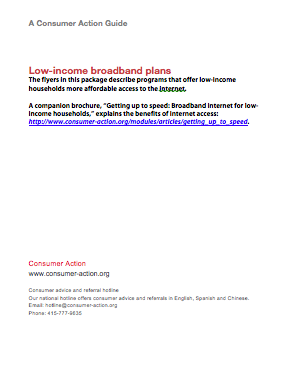 Consumer Action created this brochure with funding from Comcast NBCUniversal.